uses the Pillars to clarify a process called the Lightning Flash. two tendencies as if stretched between the poles of a battery. is, to stay within its boundaries." thing is distinct from every other thing. and  structured form from of the top of a pillar to  the  bottom. created and sustains the creation. justification for why Something came out of Nothing. It just did. the unrealised potential of the creation. Inferior Mother, the sephira Malkuth). about genuine improvements to our common life. the sephira Gevurah by the preservation and destruction of  form. There has to be a balance between creation and  destruction. its roots in upbringing (although it is easily destroyed by  it). "I don't know what to say...I just like it." articulate this understanding using some means of communication. individual  -  that last quality is reserved for  Malkuth  alone. detail, but it is not itself an individual bottle. but I will keep it for later. The process I have described is called the Lightning  Flash. seal  the  desire of your lips to announce  their  divinity. follows that all change is equally magical,  and the word "magic"
consciousness, and the modes of causality which pertain to each). qualities of each sephira in more detail. part of something greater, just as we draw water from a well. must  constantly  remember  that the map is  not  the  territory. (or otherwise) of the sephirothic correspondences. Throne. There is very little that one can usefully say about it. Chokhmah and Binah, the right and left sides of the manifest God. works. They are the very essence of the creative act. Yetzirah), then what does it represent? definitely  intangible) conditions which make creation  possible. I will make the attempt. riddle of life in time and space lies outside time and space. to writer. The author uses the attributions given in Chapter ???. where one designs bottle moulds for glass bottles. something as specific and detailed as an engineering blueprint. limited way. Yetzirah is in the process of "becoming real". sephiroth vary greatly from writer to writer. a world more resembling Yetzirah than Assiah. points of the four circles. taking in the sephiroth Netzach and Hod. This is shown in Fig X.
way I could attempt to describe this. reasons which should be obvious when you look at it. Malkuth of Briah as the Child. say no more about the extended Tree. which is unique to me. - hunger, pleasure, rest, sexual satisfaction, social status etc. it sees something beautiful it is dazzled." Note  the  close identification with the body and  its  feelings. attempt to corner the market in Mozarella. indulging  in  the "sins of the flesh". We find the  "spiritual"
reflecting  upon themselves and concluding that they are  "wrong"
points too directly towards our physical and animal nature. slain, the god that must be sacrificed. our  ability to intuit the realm of the  divine. the Neshamah encourages the creation of such reflections. change, but something at the centre of our being does not change. of Consciousness where Briah overlaps with Yetzirah. never-ceasing elaborations of the Ruach. spiritual or mundane - they are all parts of the same thing. I had originally intended to publish these notes as a conventional paper book, but decided against it. I am currently receiving 1000 visitors per month to this page alone. An initial print run for a book of this nature might be 5,000 copies, and take years to sell. Then there is the altruism, which I genuinely (no gagging) believe in. You'll find a heart-warming justification on the fly-leaf of the book. Please note the license conditions, also on the fly-leaf. This book is for personal downloading and use only. Distribution, electronic or otherwise, is not permitted. If you plan to take a copy and publish it on your own site, don't. The book is in Abobe Acrobat PDF format. You can obtain a free Acrobat reader from Adobe. This is a very widely used format for online publishing of complex documents. It looks very neat indeed. It has been specially formatted for printing on A4 paper. It should be fine on US Letter. Colin Low was born in Scotland in 1951 and attended 14 schools in Scotland, Nyasaland and Australia. In spite of this erratic education he studied physics at the University of Western Australia and graduated with first class honours in 1972. He went on to study star formation at the Institute of Astronomy in Cambridge, UK. His entire professional life has revolved around computers, with four years as a consultant, 9 years as a lecturer in Computer Science at the University of London, and 13 years as an industrial researcher with Hewlett Packard. He has authored several academic papers and is named as inventor on 27 patents. Colin has three sons, who make him feel outrageously proud. Kabbalah has been a life-long passion. He began to take an interest in 1968, and studied and practiced it informally in a number of small groups before meeting a teacher in 1978. He studied and worked with her until her death in the early 90s. You can visit his web site at: http://digital-brilliance.com/kab/index.htm (an externallink). The Tree of Life is one of the most familiar of the Sacred Geometry Symbols. 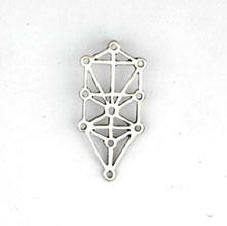 The structure of the Tree of Life is connected to the sacred teachings of the Jewish Kabbalah but can be seen in other traditions such as the ancient Egyptian.